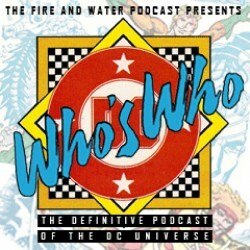 Shag and Rob concentrate on the “fire” part of the Fire and Water Podcast by talking about some classic Firestorm comics! They take a look at Fury of Firestorm Annual #3, Fury of Firestorm #s 41-47, and Blue Devil #23! Plus YOUR Listener Feedback! Before any Match-heads chime in, I realized after recording that Rafael Kayanan does come back for issue #50. Also, I had forgotten that in the New 52 era (Fury of Firestorm #19), Firestorm did battle a collection of enemies that included: Multiplex, Hyena, Killer Frost, Plastique, Black Bison and Typhoon. Annual #3: Sparx— I always thought Lacey looked visually too much like Doreen, like they were sisters or something. I found that distracting. I like Lacey better; at least Lacey never betrayed Ronnie. An almost naked Firehawk burning in the sun? I hope she wore her sunscreen that day. Not everyone in Ronnie’s life came to Pittsburgh— Jefferson Jackson didn’t. He was obviously cryogenically frozen until the CW thawed him out in 2016. 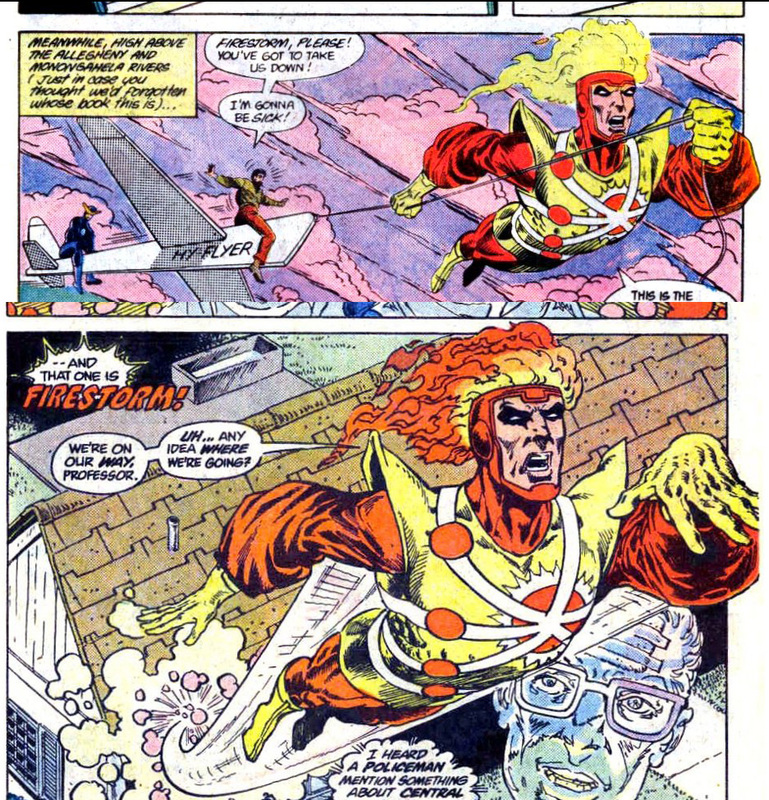 Apropos of nothing, as a kid I made up a superhero that was a female version of Firestorm (two women merging), and I named her Corona. FOF #41: It always struck me as funny how Prof. Stein becoming an actual teaching professor at a university with Ronnie as a student made Firestorm resemble the Firestorm I first met on the Superfriends cartoon series (where Professor was a professor and Ronnie was a student). Wendy Olsen (Jimmy’s cousin? She had red hair) should have been better developed. Long before Oracle, a well-represented portrayal of someone ordinary with a disability (i.e., not Professor X) was kind of rare in comics at this time. 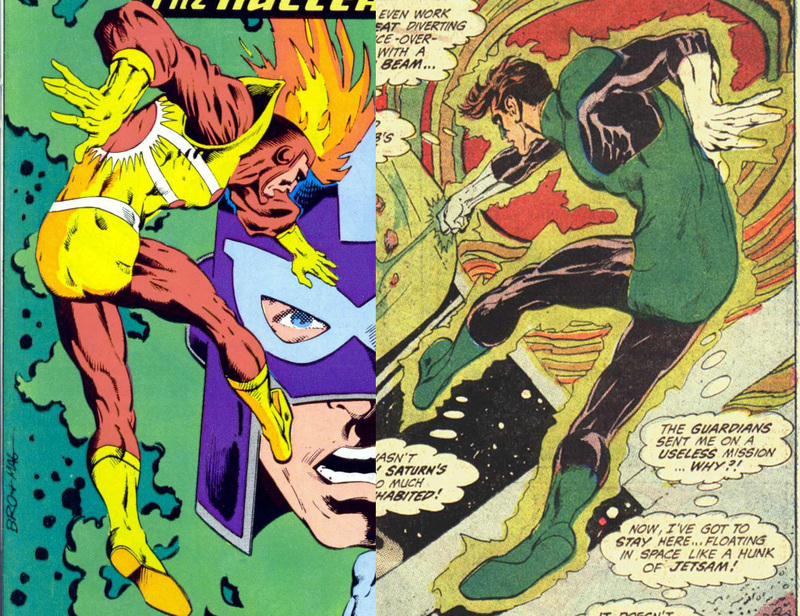 Who would win in a fight— Harbinger or Multiplex? Their powers are pretty much the same, aren’t they? FOF #42: Hotness and heroics. And Hostess cupcakes. Very alliterative. FOF #43-44: Typhoon returns. I certainly felt sorry for his kids in this issue, as I recall. I remember that comment “Who stole the kids from who?” that the cop makes. I remember how way out of line I thought that comment was. FOF #45-46: Firestorm and the Blooooooooooooooo Devil. Isn’t making fun of Slipknot sort of low-hanging fruit at this point? It’s organic rope, dammit! It’s no gimmick. Organic. Rope. Martin Stein dating his boss (Emily Rice). In today’s academic climate that would certainly be a no-no. As I recall, Martin was not exactly enthusiastic about it. A nice little gender-reversal of your usual sexual harassment scenario. I would think the plural of Multiplex is Multiplices. I remember a joke about Hyena finding Multiplex “cute” and the other villains saying, “are you crazy?” because they don’t realize Hyena is actually female. A “cute” little throwaway joke brought to you by 1980s homophobia (which was pretty much everywhere). Joe Bro swiping? Say it ain’t so, Joe! He traced Roy Raymond? At least he traced a Raymond. At least he didn’t trace a Carmichael or Doreen. Whatever happened to Joe Brozowski? I must have missed you discussing his “work” on earlier episodes. It’s amazing he got away with as much swiping as you mentioned. Bolt’s eyegear may prevent him from getting through doors, but Bolt can teleport. So no problemo. 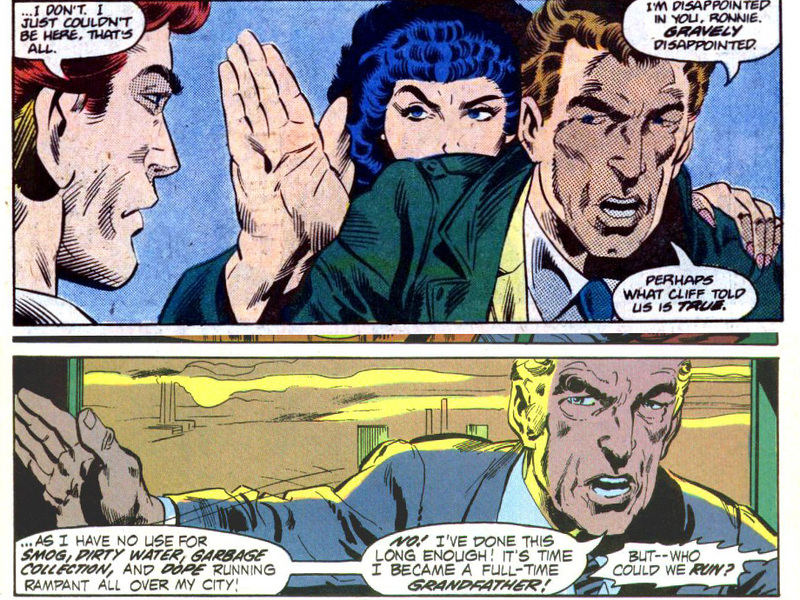 That this was not Gerry Conway’s best work is an understatement. I can’t wait to hear you guys take on King Crusher. Yeesh. Talk about a low point in someone’s career. Remember, kids, steroids are bad. Oh, and Moonbow, because a female archer character is not totally out of place in the adventures of a nuclear man. How weird is it that I can remember her alter ego— Bree Brandon— became Bree Daniels under John Ostrander’s run. I think Ostrander had said “enough with the alliterative names already.” And it would have been fair. I like (if that’s the right word) “like (if that’s the right word)”. Talk about damning with feint praise. Frank says “brisket banana split” like it’s a bad thing. I didn’t remember my own comment about Cliff Carmichael but I still agree with it! 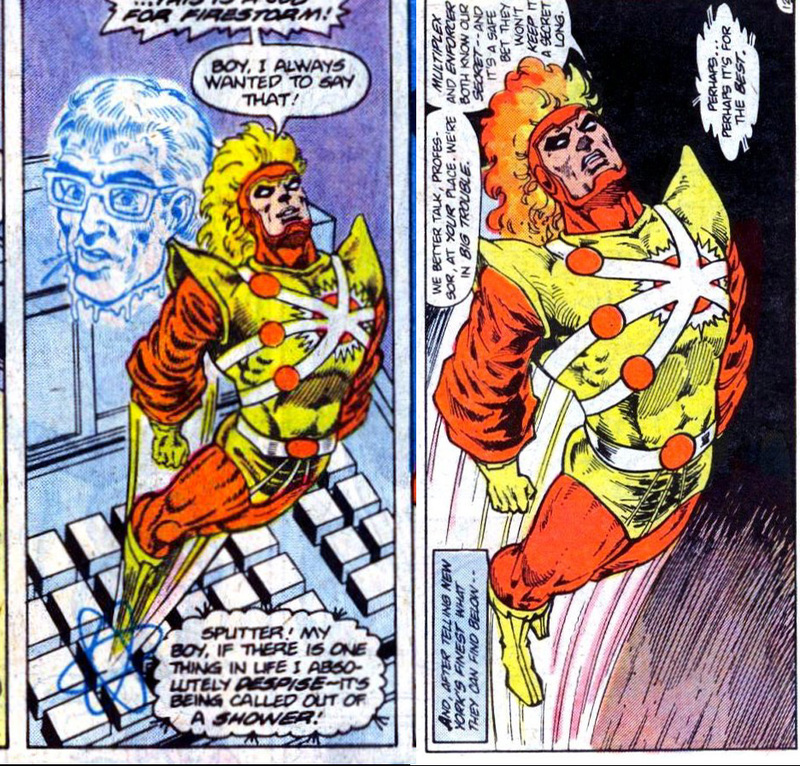 It occurs to me that Firestorm should have been subsidized by the U.S. Department of Defense as Cold War propaganda in 1977 to get people behind the safe, responsible use of nuclear power. 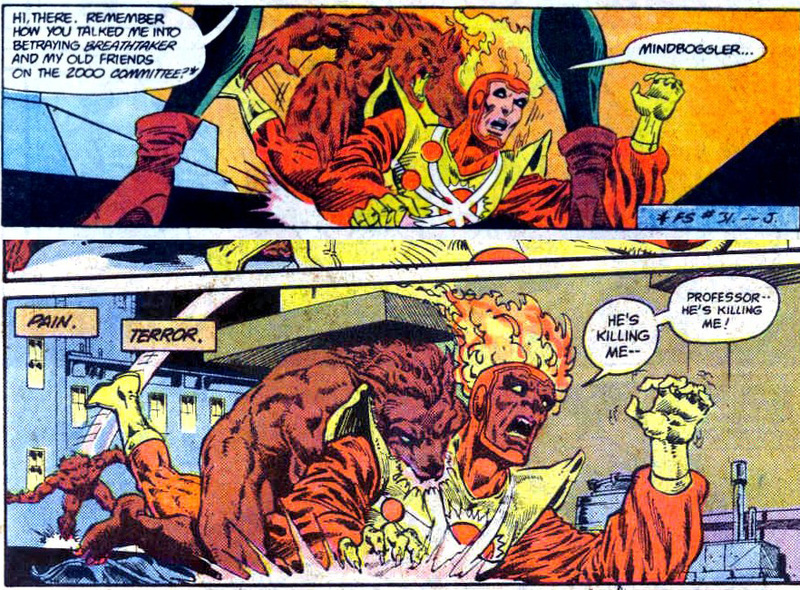 Maybe then Firestorm would have survived the D.C. Implosion and lasted more than five issues. I blame Jimmy Carter for this lapse. I suppose if we have to have Doreen around in Pittsburgh, it ultimately made sense that the Doreen/Loraine rivalry was finally given a decisive winner when one of them had Ronnie’s back and one of them really, really didn’t. It was a good way to write Doreen out, actually, even though her departure probably could have come in issue 40. I’ll be interested to hear Shag’s and Rob’s take on the issue where Doreen finally finds out Ronnie is (half of) Firestorm. Her reaction is understandable, but it still has the “it’s all about me” one-note that Gerry had exhausted with the character. She’s not at least the least bit impressed with, say, how many lives Ronnie had saved as Firestorm, for instance. I really liked the Ostrander run on the whole… they were indeed “damn fine comics.” My only problem with Ostrander’s run is that I felt that he gave up too soon on the U.S./Soviet gimmick. Had he stuck with it, and not turned to the Elemental side of the force, he could have seen Firestorm through the disillusion of the USSR and the end of the Cold War. What would Mikhail Arkadin’s role be in a post-Soviet Russia? Would Stalnoivolk go crazy with the collapse of his beloved USSR and start wreaking havoc? Oh well. It could’ve been really cool. But I suppose the sales were not what had been hoped for during the Blank Slate (Russian) period. 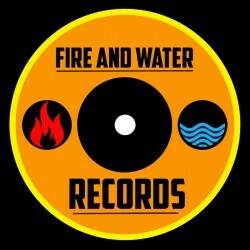 Until next time… and try not to let next time be next year… fan the flame and ride the wave! I’ve always wondered how a Shag-solo show would sound. Now I know. I hope Rob got a lot done during this episode. The gutters needed cleaning. Old food needed to get tossed out of the crisper tray in the fridge. I hope Rob managed to get his flu shot, too. 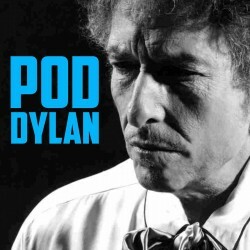 Much like Gene Hackman in the Lester cut of Superman II, Rob never actually showed up for recording. Everything you hear is a body double and sound-alike. They couldn’t say “cal-lassic” correctly, so they won’t be coming back for future Firestorm episodes. 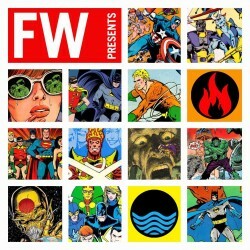 It was great to have a classic Firestorm review episode. I hadn’t realized it had been that long since the last one. After a year long hiatus, this was a good series of issues to review. Seeing the return of so many familiar villains helped to jog my memory regarding everything that had happened previously in the title. The blast-from-the-past listener feedback section was a lot of fun too. As I listened, I was trying to remember 1) if I had commented on either of those episodes, and 2) if so, had I said anything intelligent. For the record, it was yes on 1 and no on 2. As I was listening, I was trying to remember if I had these issues. I don’t think so. I know I stopped buying Firestorm around this time. There had been no consistency on the art for several issues, the stories were kind of blah, and, for me, the change in locale. I have nothing against Pittsburgh. I think that I would have been all for a change in Ronnie’s life that he initiated. (I just realized how passive a character Ronnie Raymond was!) However, the idea that he’s going off to college, with his girlfriend, AND his mentor, AND his rival, AND his father, AND his father’s fiancee, was too forced for me. So there’s .75 for another comic. I definitely had these issues back then but somehow most of my Firestorm issues disappeared. 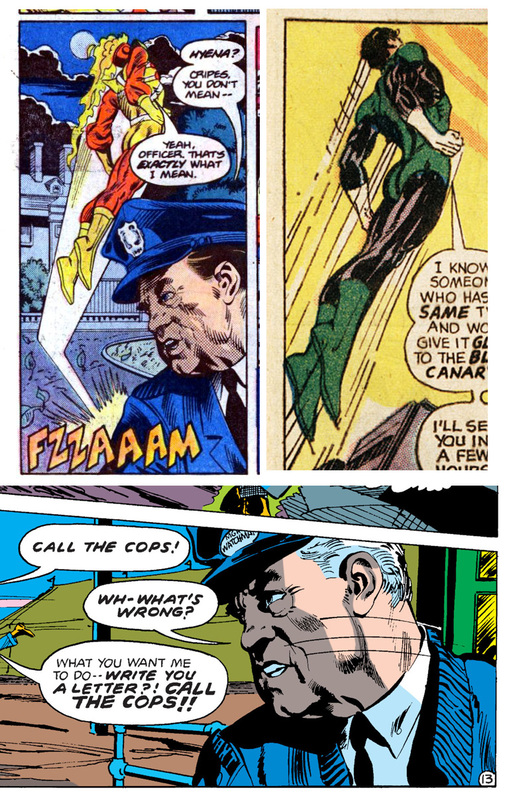 I do have the Crisis crossover issues and will agree with Shag that Akins and Garvey give the art a sort of polish. Definitely liked the look of both those crossovers. And, as you say, both were true crossovers. I find the rare swipe to be fine but when entire issues seem to be swipes, sometimes artists plagiarizing themselves, it becomes distracting. I know this is probably a bad example (and I’m prepared to be ridiculed) but Greg Land’s art on CrossGen’s Sojourn is very good and clearly before he bought a lightbox. But I see Sojourn panels in almost every book he has done since. Annoying. Although, philosophically, can you swipe yourself? And is that less a crime than swiping someone else? And forgot to say that the ‘punch in the face’ tactic is always scary to me. What if she didn’t get knocked out and instead was still conscious but now with a broken jaw? How do you explain that? Anyways, you better be pretty confident that you can ‘one punch’ your father’s fiancée if you pull out that strategy! Thank you for pointing that out, Anj. 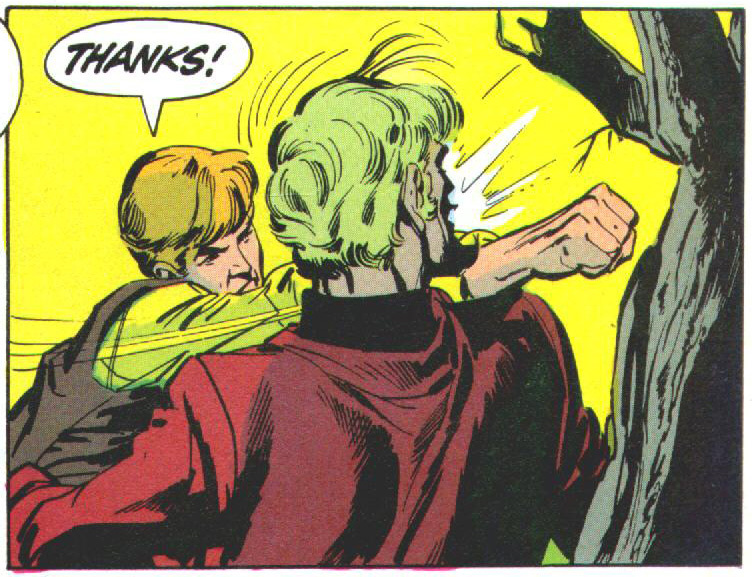 I know it’s a trope from movies and comics forever, but the “knock them out to keep them out of trouble” thing is just scary dangerous in the real world. Brilli episode. 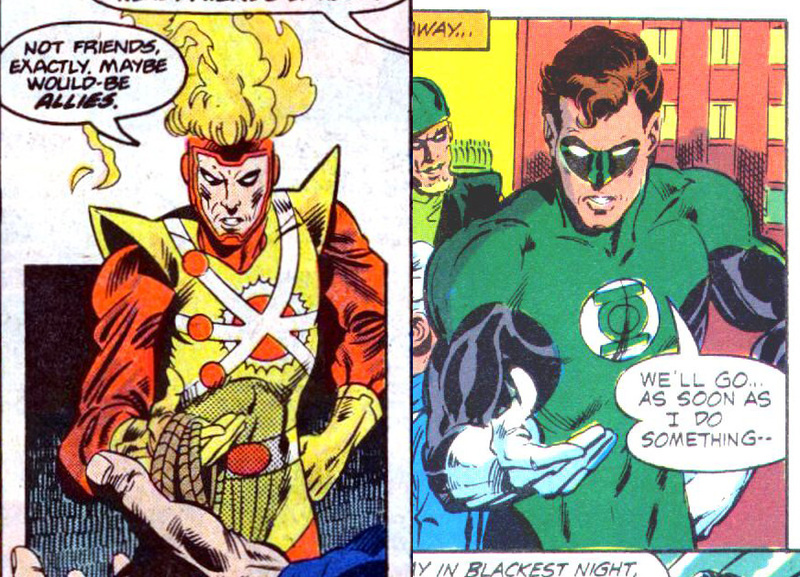 It’s so great to have some Firestorm talk after all this time, especially as the both of you found them engaging. Even though these issues weren’t quite as strong as the first couple of years, I still loved them. And I like Ian Akin and Brian Garvey’s inks – they were Rom’s secret weapon. How self-centred is Doreen Day that she assumes Firestorm has followed her to a new city. I hate her, with her stoopid Farrah wannabe hair. Have I mentioned that? I know I harp on about this a lot, but I really miss subplots in comics – few writers bother even trying to do them these days, and when they do, they can’t necessarily pull them off. They should look at the work to be done here, Gerry was the master of the soap. A plot, B plot that will likely become A plot, C plot with the supporting cast… how hard can it be? Seventies Marvel writers regularly did wonders in just 17 pages. Shag, you should really complain to DC and comiXology about the book colouring, you never know, it might do some good. I love that tentacle cover on #46 that Shag hates, especially the villains at an angle. Very infantino. 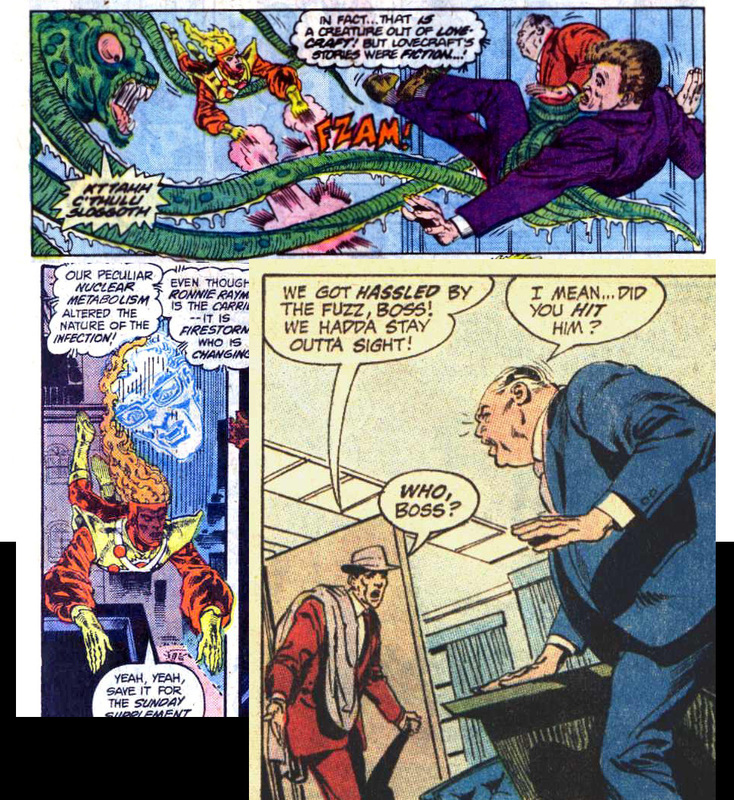 And so what if the monster looks silly, this is comics… perhaps Mindboggler lacked imagination? I always liked Alan Kupperberg’s art, from the Invaders on. I hope he’s still drawing merrily in Heaven. So Brozowski swiped a Buckler Black Canary? The question now – from whom did Buckler nick it? one of those pics he mentions online – it’s just gorgeous. In the feedback Rob says ZANtanna. That’s such a common mis-speak. Even my chap Steve, not a comics reader, says it. I’m not having a go, I just wonder if anyone has any idea as to why an extra ‘N’ gets in there… it’s not like Zatanna is like any other word this side of Zatara. We need the League of Lunatic Lexicographers! 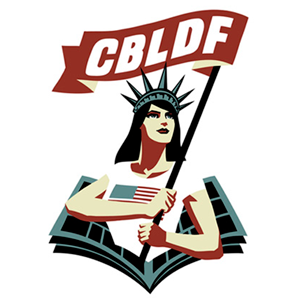 Martin – THANK YOU for that link to the additional graphic novel image!! Much appreciated! 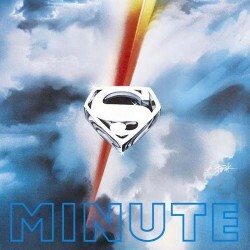 I would guess getting “Zatanna” mixed with “Santana,” the band. Ahhh see, I’m too young and Briddish to have thought of that! Thank you! 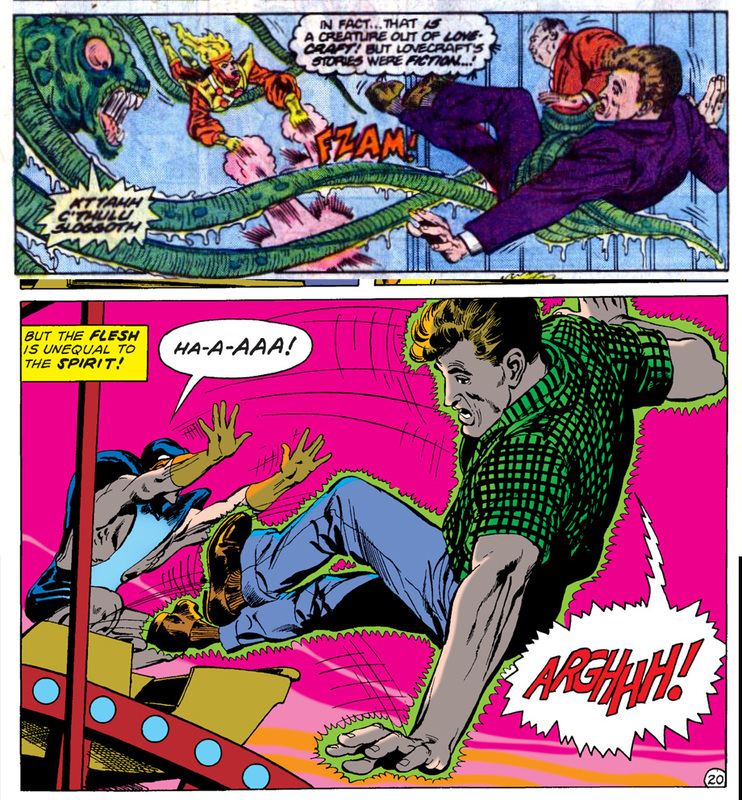 Rick Buckler swiped the pose from Neal Adams; Strange Adventures v1 issue 211, page 5, panel 4. Sum, this stuff is so fascinating, well done! Now, how do we turn this into a podcast. ‘Swipe right’, maybe? The “Taking a Swipe at Joe Brozowski Podcast”…? Green Lantern v2 #87, Green Arrow story, page 4, panel 2. I don’t get this one! Wrong panels? Previously I had pointed out the Edward Raymond swipe from the Strange Adventures Deadman tale. 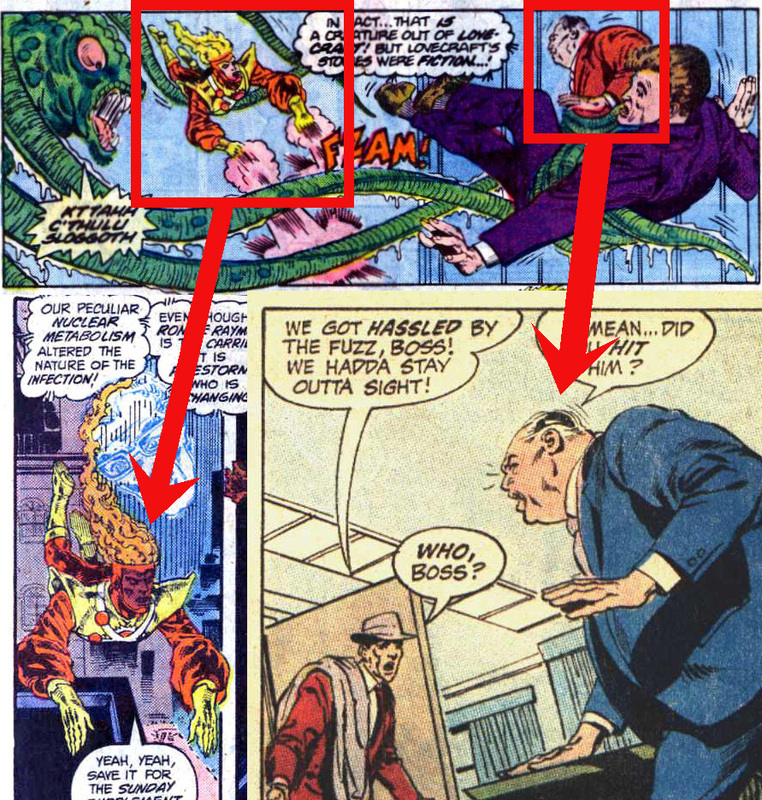 However, It was not just Edward Raymond that was a swiped pose, the Firestorm figure and the balding man held by the monster were also swiped from the panels below. Lots of interesting issues covered here. And of course, my man Blue Devil in the mix made me very happy. So you can count on me to keep pressuring Shagg to start up Devilcast. Come on, you know you want to. Do it. Do it. DO IT!!!!! Great conversations, guys! Fun to catch up with our favorite flame-headed superhero. I want to read that Zahler letter now. Haha! Thanks for entertaining me on a cold gray day!